"With permission from Paustian (1994), McGill (1996), and Molina and Smith (1998). 'S, microsite; P, plot; F, field; C, catchment; R, regional; N, national; G, global. cMi, minutes; H, hours; D, days; W, weeks; Mo, months; Y, years. This is generally low enough that using first-order kinetics would not introduce significant errors. The size of the microbial population remains implicit in the firstorder kinetic constant k' (as X0 in the pmaxX0/Ks term). A fundamental assumption of process-oriented models is that microbial processes are never limited by the size of the microbial population. In other words, there is always sufficient micro-bial diversity, and populations grow rapidly enough, to adapt to environmental stresses and changes in substrate supply. These assumptions are generally valid for ecosystem-level models of organic matter dynamics and decomposition; however, caution should be used when modeling specific processes performed by specific organisms, such as nitrification. Most models of soil organic matter dynamics begin by modeling the decay of litter at the soil surface. The models assume that plant material contains a readily decomposable fraction (typically water-extractable material—sugars, soluble phenols, and amino acids) and a more resistant fraction containing cellulose and lignin (see Chap. 12 for additional information on C inputs to soil). Experiments have shown that the initial plant litter N, polyphenol, carbohydrate, and lignin contents control litter decay rates along with the abiotic temperature and moisture environment (higher decay rates with higher soil temperature and moisture conditions). Decomposition of different plant material for long periods (2 to 5 years) under various climatic conditions shows that 5-25% of the original C remains. 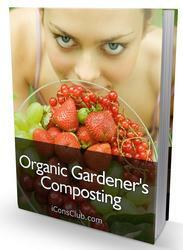 The remaining material consists of plant lignins, microbial products, and humic material. The lignin:N ratio of plant material is positively correlated to the fraction of plant material resistant to decomposition. Most litter decay models include microbes that decompose plant material and form microbial products with a slow decay rate. Many of the models also assume that the majority of plant lignin (>70%) is directly transformed into organic material with a decay rate similar to that of microbial products. Native SOM located below ground is generally described using multiple pools to acknowledge its chemical heterogeneity. The number of pools included in each model varies significantly (Table 16.3). The division of SOM into various pools is based on stabilization mechanisms, bioavailability, and biochemical and kinetic parameters. Generally, the pools consist of at least one small "active" pool with a rapid turnover rate and one or more larger pools with slower turnover rates ranging from a few decades to thousands of years. The active pools are more closely associated with measurable entities such as microbial biomass, while the longer lived pools are generally more conceptual. A detailed description of each model is beyond the scope of this chapter; however, we present the Rothamsted, Van Veen and Paul, and Century models as examples, with the focus on how they are constructed and on differences among them. FIGURE 16.4 The ROTHC model showing the flow of carbon through the turnover model (with permission from Jenkinson, 1990). DPM, decomposable plant material; RPM, resistant plant material; IOM, inert organic matter; BIO, microbial biomass; HUM, humified organic matter. (k = 0.03 year-1), (2) decomposable plant material (k = 4 year-1), (3) microbial biomass (k = 0.41 year-1), (4) chemically stabilized SOM (k = 0.0003 year-1), and (5) physically stabilized SOM (k = 0.014). The large number of data sets used to parameterize the model included incubations with 14C-labeled plant material (1- to 10-year periods), 1950-1990 thermonuclear radiocarbon generated by atmospheric bomb testing, microbial biomass estimates generated from chloroform fumigations, radiocarbon dating of SOM fractions, and measured long-term soil C levels at the Rothamsted plots. The decomposition rate of each of these components was assumed to be first order. 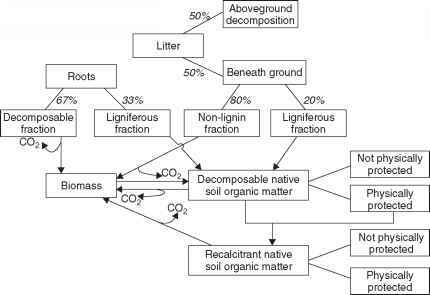 It was also assumed that during decomposition each of the five components decayed to CO2, microbial biomass, and humified organic matter in similar proportions (Fig. 16.4). The fit between the model and the experimentally determined results suggested that the model was a useful representation of the turnover of SOM in cropped soils. The model has since been tested using a variety of SOM data sets from cropping systems, including data sets from Rothamsted, England; western Canadian wheat-fallow systems; and sugarcane soils in Brazil. The initial version of the Rothamsted model used measured C inputs to drive the model. However, later versions simulate plant production and nutrient cycling. More recently, Jenkinson (1990) added the impact of cation-exchange capacity on SOM stabilization. This alters the partitioning between CO2 and biomass plus humus. Cation exchange capacity was preferred over clay content because it also accounts for changes in clay mineralogy. The new version of the model also replaced the small highly resistant pool (k = 0.00035 year-1) with an inert pool to account for the very old measured radiocarbon ages of SOM. Results from both the ROTH and the Century models suggest there is a considerable amount of uncertainty about the processes that control the formation of passive or inert SOM. Recent experimental results from Australia would suggest that charcoal from the burning of grass and trees is an important source of inert SOM. However, the necessity for an inert pool versus a very recalcitrant pool is still under debate. FIGURE 16.5 The structure of the Van Veen and Paul model for soil organic matter dynamics (with permission from Van Veen and Paul, 1981). 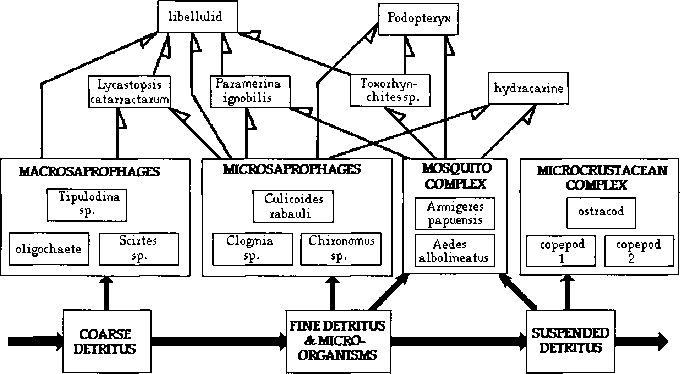 Van Veen and Paul (1981; Van Veen et al., 1984) developed a SOM model (Fig. 16.5) in which plant litter is divided into three fractions: (1) easily decomposable sugars and amino acids, (2) slowly decomposable cellulose and hemicellulose, and (3) resistant lignin. The soil C pools include: (1) microbial biomass, (2) decomposable SOM, and (3) recalcitrant SOM. The model assumes that microbes decompose the SOM and litter pools and that a certain fraction of the material decomposed will be stabilized into microbial biomass. Once dead, the microbial biomass can be considered as an easily decomposable pool (cytoplasm) and a more resistant component (cell wall). Table 16.4 shows the decomposition rate constant of the microbial biomass and the size of the microbial product pools. The size of the microbial product pools is small, as these values describe only the products formed from the recently added residue, as would be found in a 14C-labeling experiment. Having the model separately follow tracers such as 14C and 15N can yield a great deal of information about recently added components and results in rigorous testing of the model.